Owl Investigations Private Investigator – Halifax, Bradford, Huddersfield, Wakefield and Leeds Private Investigator. Owl Investigations, Not Another nationwide company we specialise in Halifax, Bradford, Huddersfield, Wakefield and Leeds. Private Investigator covering West Yorkshire. 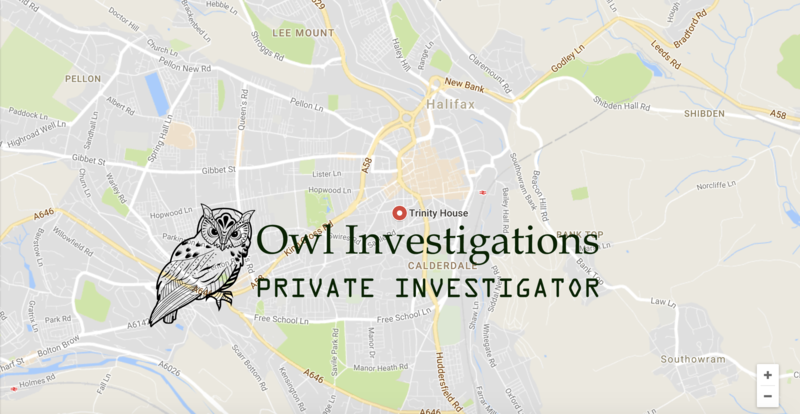 Established in 2001, Owl Investigations is an experienced and professional private detective agency in Halifax, Bradford, Huddersfield, Wakefield and Leeds; working with corporate, legal and personal clients on a wide variety of investigations. As of August 2017, Owl Investigations has been taken over and is now being run by an extremely established, professional and experienced team of local private detectives in Halifax, Bradford, Huddersfield, Wakefield and Leeds. The additional skills, talents and experiences bought to Owl Investigations by these local private investigators can only add to the 16 years of experience and knowledge gained by Owl Investigations allowing the company to offer an extremely high level of private investigation services in Halifax, Bradford, Huddersfield, Wakefield, Leeds and across West Yorkshire. As a local private investigator in West Yorkshire we pride ourselves on being different to the larger private detective agencies who do not know the local areas as well as our private investigators; our private investigators live locally and work locally so they know the area, where to go and who to speak to which enables them to quickly get the answers you need. Each investigation case taken on by one of our private investigators in Halifax, Bradford, Huddersfield, Wakefield and Leeds. will be done so with the utmost respect, professionalism and discretion; the only way the person that is being investigated will find out about the private investigation is if you tell them or the case goes to court with our legal and thorough proof evidence collected during the surveillance investigation. Our private investigators in Halifax, Bradford, Huddersfield, Wakefield and Leeds understand that nobody contacts a private investigator agency for a good reason and it can be a very unfamiliar and unnerving experience for many people, but we will guide you through the service step by step and contact you with the latest updates throughout the investigation. We use the highest quality equipment and the experience and local knowledge our private detectives can offer is second to none. Rest assured that when you choose a private detective from Owl Investigations you are in safe hands. Let the private detectives here at Owl Investigations take you under our wing; caring for our clients and getting them the answers they need is what we do best. So if you’re in Halifax, Bradford, Huddersfield, Wakefield or Leeds hire the professionals. Contact Owl Investigations Ltd – Fill The Form Below For A Quick Response. We are truly here to help – If you’re not sure what service you require press the green chat box in the corner of the screen to talk to one of our agents.